It's an animated dinosaur movie! With kids who travel back in time! Here's the scoop: When Ernie (voiced by Pamela Adlon) isn't hanging out with his best friend Max (Yuri Lowenthal), he's blasting around town on his rocket powered skateboard. One day while marveling at Max's dad's time machine, the boys are surprised by Ernie's sister Julia (Tara Strong), and soon the trio are transported back in time straight into the nest of a dinosaur mom named Tyra (Melanie Griffith), who adopts them while they try to get back home. 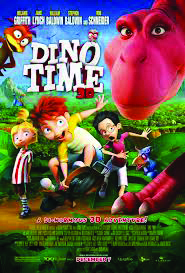 Rob Schneider voices Tyra's hyperactive son Dodger, and William and Stephen Baldwin play scheming dinosaurs. Cute for little ones, and we'll take Melanie Griffith on the big screen in any form.